Truth be told, most people don’t think about skilled nursing care until an aging parent, spouse or other family member needs more help than a caregiver can provide. 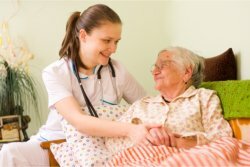 Skilled nursing care facilities, commonly referred to as nursing homes, are licensed healthcare facilities that are inspected and regulated by a state’s Department of Health Services. They offer long- and short-term care for individuals who need rehabilitation services or who suffer from serious or persistent health issues, such as Alzheimer’s disease that are too complicated to be tended to at home or at an assisted living facility.